The Liberian Biometric ECOWAS Passports Application Center (PAC) in the Schengen zone of Europe was officially opened on Saturday at the Liberian Embassy in Brussels, Belgium. 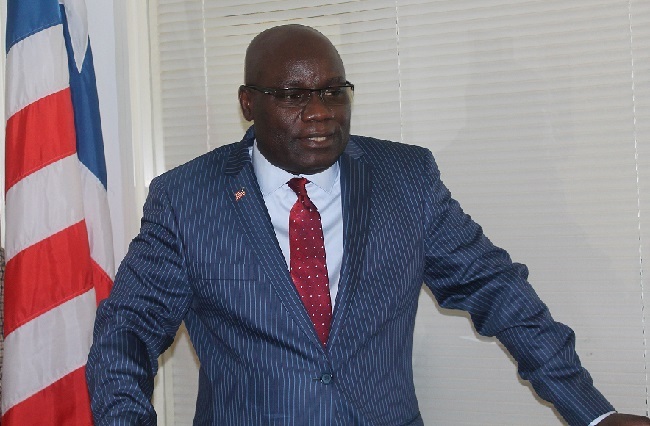 Speaking at the program, Isaac W. Nyenabo II, Liberia’s Ambassador to Belgium, the Netherlands, Luxemburg and the European Union, said the center will ease the hardships, frustration and financial cost of Liberians living in the Schengen zone of Europe in obtaining a passport. Ambassador Nyenabo said Liberians had to either travel to the United Kingdom, the United States or to Monrovia, the Liberian capital, to apply for and obtain a passport, noting that opening the passport center in the heart of Europe, where Liberians in the Schengen zone do not require visas to travel, makes it easier and convenient for them. Also speaking, the Director of Passports and Visas at Liberia’s Ministry of Foreign Affairs, Nyanda Finda-Davis said the center has now finally concluded a long discussion that had been taking place in the wake of calls made by Liberians living in the Schengen zone to the Liberian government. 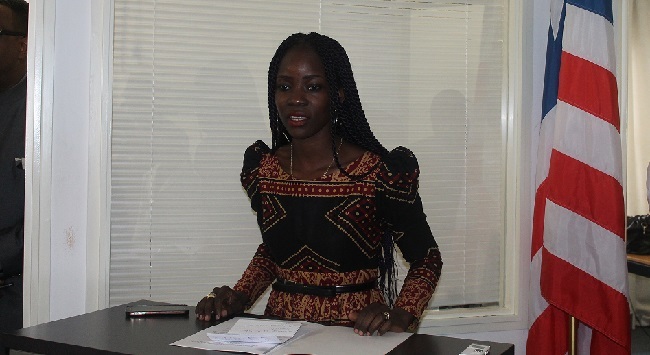 She called on Liberians to assist and work closely with the center in ensuring the work is done without hinderance. In remarks, the president of the Liberian community in Belgium, Kingston Wleh commended President Ellen Johnson-Sirleaf and Foreign Minister Augustine Kpehe Ngafuan for the opening of the center in Brussels, Belgium. Mr. Wleh said President Sirleaf and Minister Ngafuan at different times assured them of the opening of the passport center and the community was pleased that those promises have been met. He said, in the past, Liberians living in the Schengen zone had to struggle to obtain visas to either travel to the UK, USA or look for travel documents to go to Liberia and wait for weeks before their passports are issued. He said even with that, there was no assurance of getting their passports. He said with a passport center now in Brussels, Liberians from all over Europe will find it very easy and convenient to apply for and get their passports without leaving their jobs and families for weeks. 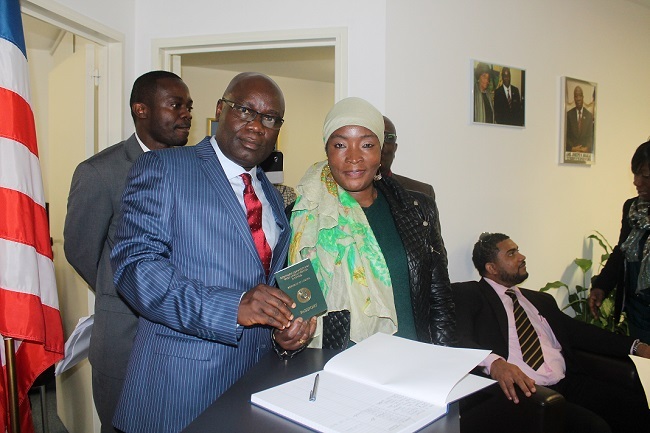 At the official launching program, a Liberian, Kathy Dunbar was presented her Liberia ECOWAS Biometric passport as the first person to receive her passport at the center. 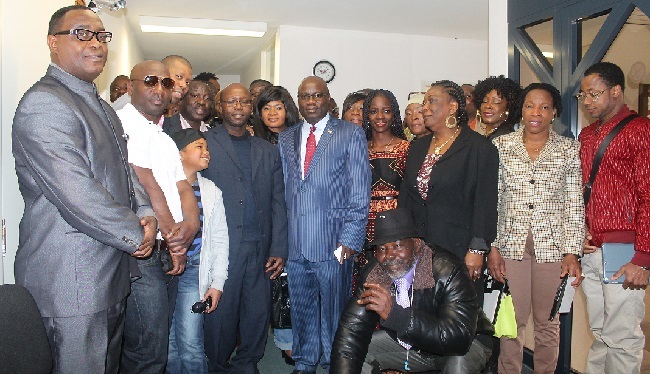 Later 22 other Liberians received their passports amidst joy and jubilation. Liberia has already opened Biometric Passports Application Centers at the Liberian embassies in Washington, New York ( both in the US) and London, the United Kingdom. I am a Liberian wanting to travel to Europe to improve my football career. I have some finance to make my trip;but obtaining the visa has been difficult for me. Now; I am happy that Liberia have embassy in Belgium.please help me obtain my visa and I will be responsible for the fees. May God in his goodness bless you. To whom it may concern, Your excellence Ambassador/Counsellor. I’m writing to criticize one of your publications of 2015/04/06, concerning issuing the biomentric passport in Belgium. Where accoing to the director of passports and visas Ambassador mrs Finda. Said and quote”the senter will ensure that genuine Liberians are processed, screened, and issued passport. While others who are not liberians but holding the Liberian passport or travel documents will have those documents retrieved. Personally I felt it’s embarrasing to the world to write such publication on your site. calling an passport issued by the Liberian government as not geniune or the people holding such are not Liberians is disrespectfull to the Liberians and government entirely.This is because the Liberian government has procedures to obtaining the ordinary Liberian passport to the Liberians. Therefore calling the holders of such passport as Non Liberians is amount of innefficiencies on one hand and very disrespectfull to the Liberian government at large. I’m. a Liberian by nationality,I want to know how can i get. a Belgium visa in Liberia. I’am a Liberia living in France , from bong county (gbarnga), I just wanna know how long does Liberian passport last in Belgium because i am going to school always ? I want to move for my passport to Belgium and how much does it costs?